The dangerous beauty of Lavender Tides is harboring secrets that reach around the world. Ellie Blackmore is making a name for herself as a house flipper. But when her sister Mackenzie disappears, Ellie can’t focus on anything but uncovering what happened. Her only clue is the bloodstain on the deck of Mackenzie’s boat. Ellie knows her sister isn’t on the best of terms with her ex-husband, Jason, but he wouldn’t kill her—would he? Coast Guard intelligence officer Grayson Bradshaw believes Mackenzie faked her own death after stealing a seized cocaine shipment. The problem is convincing Ellie, who seems to view him as the true enemy. Both Ellie and Grayson want truth, but truth—and family—is often more complex than it first appears. 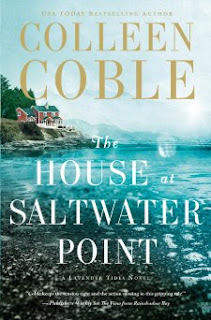 From international terrorism to the peaceful lavender fields of Puget Sound, The House at Saltwater Point is a thrilling race to uncover the truth before it’s too late. Thanks to BookLook Bloggers for providing a free copy for my honest review. All thoughts and opinons are my own and I wasn't required to give a positive review. Sounds interesting, and the house-flipping makes it sound like present day.